Do you read the paper? I do. 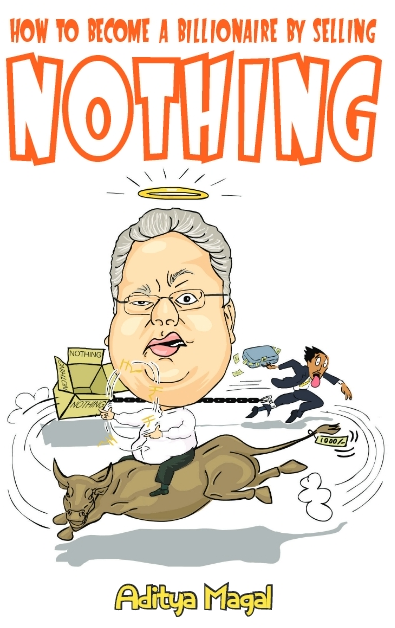 Better still I own one .Recently I was reading this from The Jhunjhunwala Times. ‘NATIONAL PERSON’ Assistant Commissioner of Police Pradyuman aka ACP Pradyuman is an extremely happy man. Beaming from his left ear continuing the beam all the way to his right ear intermittently displaying his impeccably white frontal teeth, he chats quite chattily about his favorite Chaat hangouts in Chhattisgarh. “I Like Pani Puri,Dahi Puri,Sev Puri and even Masala Puri.Incidentally I enjoy watching films with Om Puri and I’m married to a woman who makes excellent puri’s. So basically I’m a very Puri person” ,he quips quite wittily much to the amazement of amazed people. 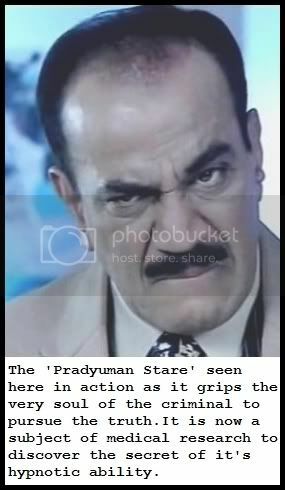 It’s a rare sight to catch ACP Pradyuman in such a good mood, as the man who heads India’s toughest and most successful crack team of super elite detectives the CID or the Crime Investigation Division, he hardly ever finds time to chat about Chaats or pretty much anything in general . Anointed with the prestigious title OF ‘NATIONAL PERSON’ by the Government of India, ACP Pradyuman is lovingly and respectfully known as ‘Sir’ to his colleagues and non colleagues alike. But for the rest of India he will always be ACP Pradyuman whose dealings with the scourge of crime has become the stuff that legends are made of. So successful has his team been that their chronicles have run and continue to do so everyday on Sony Entertainment Television popularly also known as Sony TV. “Yes indeed, we can solve any case in 42 minutes flat. Whether it be murder, kidnap, theft, acCIDent, molestation, missing person ,anything.Forty two minutes, hear me 42 minutes is all that we require to solve the case and put the bloody criminals behind bars” roars a frighteningly confident ACP Pradyuman. 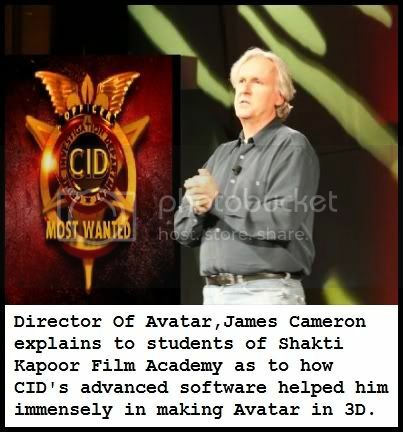 “Many think that because we have such a high success rate our team is refused promotions but the fact of the matter is everyone among us refuse our own promotions to a higher rank in order to avoid being transferred and for Pradyuman Sir, if he becomes Commissioner then he has to sit behind a desk and the team will lose a brilliant mind so he himself volunteered to sacrifice his promotion and we too followed so we can catch the bloody evil criminals” says Inspector Daya clearing up misconceptions as his eyes well up in admiration for his boss ACP Pradyuman. But computers no matter how fast cannot compensate for human aggression. 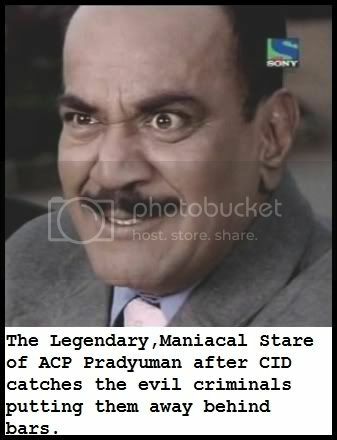 Every criminal caught by CID quivers in his boots at the very mention of the PATENTED STARE of ACP Pradyuman, now being chronicled by medical researchers worldwide for its radical truth producing effects. “And once we solve the case the Criminals know that their time is up with Sir’s stare staring a hole right through the very depths of their vile, putrid, crime filled interiors.” Reinforces Inspector Abhijit. Suddenly ACP Pradyuman’s cell phone rings and the team rushes off to solve another crime. Thank you NATIONAL PERSON ACP Pradyuman, The Jhunjhunwala Times salutes you. As long as you and your team are on the job, criminals watch out. 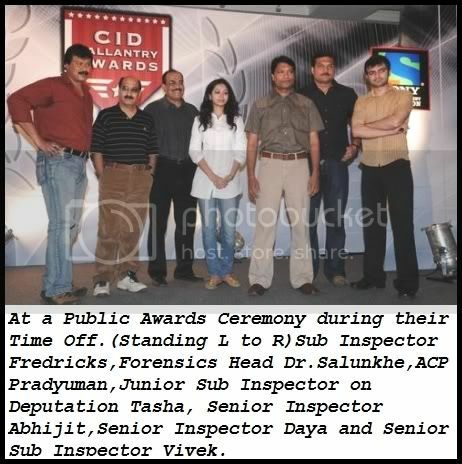 Thank you CID, Jai Hind!